Here is a round-up of this week’s travel news – from free meals, the 80’s, and romance, to ticket prices at hub airports. Enjoy! Are You Paying More for Plane Tickets Because of Where You Live? Airports with a dominant hub airline present tend to extract more from travelers’ wallets, says BusinessWeek. So what can folks do to bring down the cost of their flights? Well, if you live close to airports like Washington-Dulles, Houston-Bush, Newark-Liberty (all United Airline hubs) or Cincinnati (a Delta Air Lines hub), use Fly.com’s Today’s Best Fares tool to find the lowest roundtrip fares over the next 90 days. Alternatively, think about booking non-direct. Flights out of a hub tend to be nonstop and this gives the airline pricing power. United is inviting couples to share their love stories for a chance to win two BusinessFirst tickets. But before you get too excited, the competition is only for customers whom United help connect with a special someone. If that is you, you have until February 5 to submit your United-in-love story in 500 words or less. 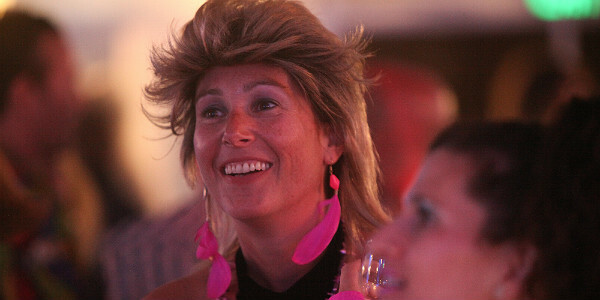 Having recently spent months planning and executing an 80’s themed birthday party extravaganza (that is me in the wig below), I was thrilled to read Aaron Perlut’s rave review on Forbes.com for Delta Airlines newest safety video. If like me, you too remember big hair, leg warmers and watching movies like Top Gun and Dirty Dancing – not to mention listening to hits like Livin’ on a Prayer, Don’t Stop Believing or Take On Me – this is definitely a video you should watch! Are Airline Tray Tables About to Get a Makeover? SmartTray International is looking to update airline tray tables for today’s technology-enabled lifestyle, with a new design that is more friendly for passengers wishing to use their laptops and tablets in-flight. It seems one man found a loophole that helped him score free meals (for nearly a year) from China Eastern Airlines. By changing his itinerary more than 300 times, he was able to use his first-class ticket to receive free meals and drinks in the Xi’an airport VIP lounge in China. Delta cancelled 1,850 flights on Tuesday ahead of yet another winter storm – this time affecting passengers traveling through Georgia, Alabama, Florida, Louisiana, Mississippi, the Carolinas and Texas. In Chicago, nearly 1,000 flights were scrapped at the city’s two main airports on Sunday and Monday because of cold temperatures, and another 185 flights were reportedly cancelled on Wednesday. The State Department has complied a helpful list of tips, locations and websites for those travel to the winter Olympic and Paralympic games in Sochi. Websites include safety and security information; tickets and Spectator Pass requirements; transportation and shuttle locations; and LGBT traveler information. Yesterday we announced the results of a new Fly.com consumer survey that raises the question of whether airlines should ditch unpopular fees and instead charge for the services that will increase passenger satisfaction. The new research found a gap between the services that fliers want (and are willing to pay for) and those currently being offered by airlines. The most objectionable fee was checked baggage. Yet fliers are willing to splurge on things like dedicated overhead bin space, priority baggage claim, and stopping the seat in front from reclining.